I love to decorate for all the holidays and Easter is no exception.We will be hosting Easter dinner this year for 18 people and I have decided on a bright green and hot pink colour theme this year. While looking for some inspiration on Pinterest, I came across some great decorating ideas. 1. Easter Bunny Folded Napkins - So cute. They are easy to do once you ' get it' but you will need to practice. Be sure to start with a large square napkin and then fold it in thirds to make a long rectangle. For folding instructions, click here. 2. Nest With Eggs - These cute little nests are made from chocolate covered crunchy wonton noodles. Simply toss noodles in a bowl with melted chocolate. Form into a nest shape with your hands and make an indent. Work quickly in batches before chocolate sets. Place nests on wax paper to set and place candy eggs inside. 3. Calligraphed Eggs - These are so beautiful and, if you have excellent hand writing , would make lovely name cards. 4. Umbrella Door Decor - If Easter was in April, this would be a great alternative to a typical wreath. I only wish we had spring showers instead of the snow showers we have had recently. 5. Jelly Bean Tulips - A plain glass vase filled with jelly beans adds a festive touch to a bouquet of tulips. Simpy insert a small glass container inside the vase you are using. They should be close to the same height. Fill the space between the vases with jelly beans and add tulips to the inside container. 6. 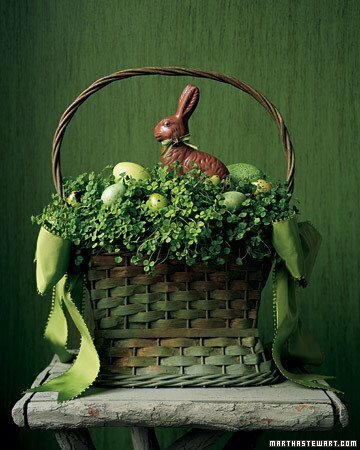 Easter Egg Centerpieces - For an easy centerpiece, add eggs and some moss, grass or ferns to a large glass hurricane. 7. Carrot Treats - I love this idea. Fill a cone shaped cello bag with orange treats and tie with green rick rack or ribbon. I would substitute orange Jelly Bellies for the gold fish but if the kids have had too much sugar, the gold fish might be a good alternative! I hope you feel inspired too.